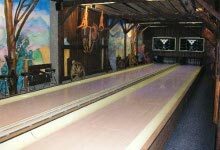 Bowling Club Stodola can be found on the way from Banská Bystrica right at the entrance to the town of Ružomberok. Two bowling lines (each for 12 persons), laser shooting range and a flight simulator are waiting for you. Guests can entertain themselves at table football, table hockey or at a billiard table.